The smell of a dead animal is terrible no matter where you encounter it, but in the confined spaces of your car it can be particularly bad. Animals can crawl into areas around your engine for warmth or into air ducts. If the animal dies, the resulting dead animal smell in your car can last for weeks. If you hit an animal, the dead animal smell in your car, even with steam cleaning, may remain. You need stink relief that is long-lasting and fast. Smelleze® Reusable Dead Animal Smell Elimination Pouches remove dead animal smells in cars for weeks or even months and can be reactivated in direct sunlight. It’s a beautiful Monday morning. You finish breakfast and head for your car, ready to tackle traffic and start your workday. Once inside the car, you notice an odor, and maybe think about how it might be time to get the car detailed. Encountering a dead animal smell in your car can happen anytime and may be worsened by your engine reaching normal operating temperatures or by using your car’s heating or A/C system. No matter how you’re made aware of it, that dead animal smell in your car must go! Any dead animal is going to reek, but some will smell worse than others, and getting rid of the smell may be more difficult, for various reasons. For example, hitting a skunk with your car will produce a much stronger dead animal smell than a mouse that has crawled into your heat ducting and died. Skunks carry their own stink weapon, which combines with the regular horrible stench of decomposition, making an overpowering problem worse by several magnitudes. The mouse in your car’s heat duct is extremely difficult, if not impossible to remove so if that little carcass is left to rot, the dead animal smell in your car will last much longer. So, the intensity of the dead animal smell in your car and your ability to eliminate that smell can depend on the type of animal that has died, and where that dead animal is inside your car. Another element can affect the intensity of the dead animal smell in your car: the environment, mainly Hot and Cold temperatures, around the dead animal’s location. Heat speeds the natural decaying process and also forces more odor molecules into the air surrounding the carcass. Cold acts as a delaying force in the decay process, which can prolong that process and the accompanying dead animal smell. This can mean that in colder seasons an animal may crawl into a nook around your car’s engine, seeking the comfort of its warmth. The animal may perish from natural causes in that spot or when you start your car’s engine again. Either way, the dead animal will subsequently be heated by the running engine, and then cooled, possibly even freezing and adhering to the engine, once when the engine cools. This heating and cooling cycle will continue until the carcass fully decays and no longer stinks, which could take months, during which time your car will alternately be filled with a dead animal smell that seems to mysteriously appear and disappear. Once your nose is assaulted by the stench of a dead animal in your car, you need to find the carcass. If not immediately obvious, such as knowing you hit the skunk or other small animal, or you cannot visually locate the carcass, you will have to rely on your nose – or someone else’s nose. Sniffing out the stench is an unpleasant, but very necessary step in your dead animal smell elimination plans, because the location can determine the most pro-active de-stink actions you can take. Now that you’ve either found the dead animal or have narrowed its location down to a certain area, you can start getting rid of that foul odor. If the animal was hit by your car, you will need to clean the tires and undercarriage with a power washer to remove any decaying carcass bits. If the animal has crawled into your car’s heating/cooling system or nooks in and around your car’s engine, you will need to remove the carcass, if possible. When this isn’t possible, you will need to use an odor eradicator to combat the air-borne odor that will last until the carcass is completely decomposed, which could be a week or weeks. 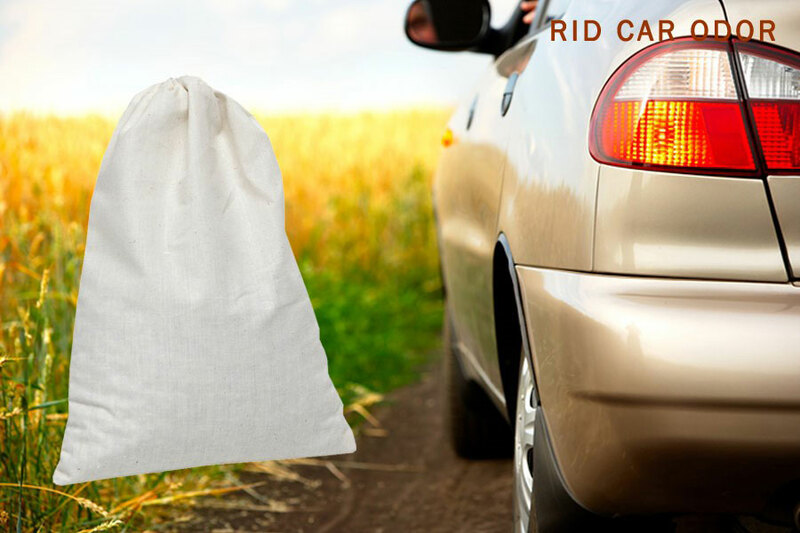 Fortunately, there is a perfect odor elimination product ready to fight the dead animal smell in your car that begins working from the moment you get the first foul whiff: Smelleze® Reusable Dead Animal Smell Eliminator Pouches. Easy to use, extremely effective, and truly long-lasting, each Smelleze® Pouch works at the molecular level to trap and neutralize air-borne odors. Even if you cannot locate or remove the dead animal, Smelleze® Pouches will eliminate the smell from your car. There is no need to replace a pouch, as each Smelleze® Pouch is reusable and can be reactivated in sunlight. This allows for long-acting effectiveness against the dead animal smell in your car. Don’t cover up odors with sprays that can add to your smell problem or may have the potential of staining or discoloring your car’s interior surfaces. Stop that dead animal smell in its tracks with Smelleze® Reusable Dead Animal Smell Eliminator Pouches — and breathe deep! When You Can’t Remove a Dead Animal – You Can Remove the Smell!